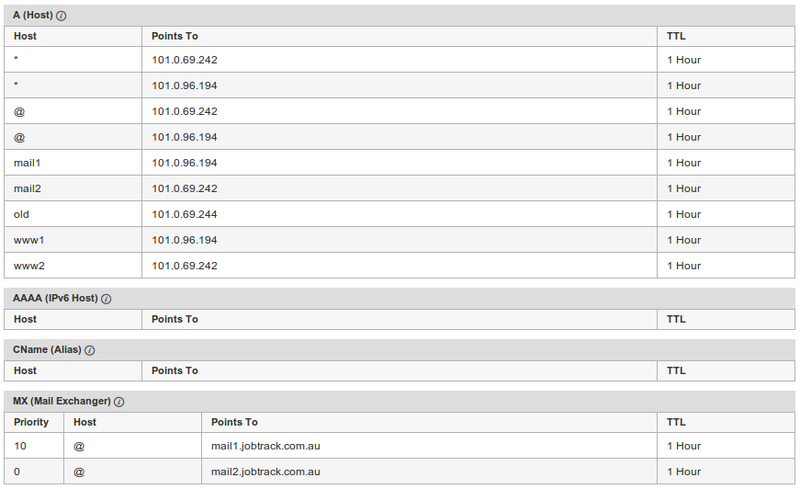 Now the DNS server returns both IP addresses for each www query, in random order. If both web servers are up, obviously no problem. If one is down. the questions are, will the browser try the second IP address. and how long does it wait to do so? Ideally the static IP of one server would be from one network provider and the other server IP would be from another network provider. This means we are not reliant on one network provider. The client browser will choose one of the identical servers. If it can't connect to one then it will try the other. Using recent versions of IE (8 and above), Opera, Safari, Firefox and Chrome. The browser will try one web server and if it can not connect the browser will try the next server, the process is user-transparent, and occurs only if the first server tried times out, and only for the first page requested from our site in any browser session. The DNS round robin works best if the server is actually off not just slow/timing out as the modern browser can move to the next very quickly. Browsers older than IE8 are not supported by the ST web application, but may still be used to view the web sites. Old browsers such as IE7 will only use the first IP address. Rolling restart of the servers can be done transparently ( restart 1 server a few minutes later the next server). If one server crashes the users will transparently move to the next. The browser connection is "sticky" which is very important i.e. once the browser connects it will stay connected to the server it originally connected to. During periods when one server was down, users of non-switching browsers ( IE7 ) would have a 50% chance of getting the bad server in an individual browser session. The usage of IE7 is now down to below 1% of web traffic for these browsers there is no advantage but a pretty big win for all modern browsers. Note: Users with IE7 are prevented from logging into any ST servers due to the lack of HTML5 support but can be used browse the web sites.